Life is a bit "Stop the world I want to get off" at the moment. Time seems to be flying by and so much seems to be going on. But in another way time is going so slowly. I hate the cold and it feels like spring is still months away. And whilst there are lots of things going on they're things that are making me stressed. There doesn't seem to be time for fun things. It just seems to be one thing after another to worry about. Some of it real stuff and some of it things that I'm just making up in my head to worry about. I wish I could remember what being happy and carefree felt like! So what picture should I post here? 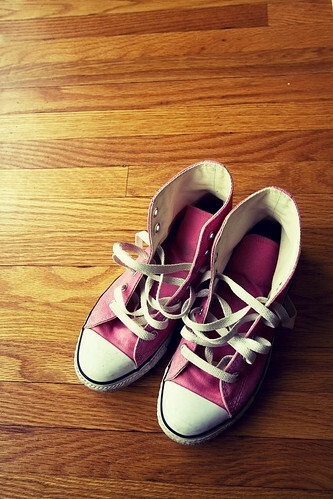 I think I will go with this one of some Converse as I love these shoes and I love this picture. Such a simple shot really but I think what makes it specially is the colour tones and I also love the messed up laces. I have actually lost count of all the Convserse shoes I have. I think it might be nine pairs. I had better get them all out soon for a little Converse photoshoot of my own!